Well, at least that is what they say I am. The reality is somewhat different. For Legend substitute powerful Healer who rather overreached herself and became somewhat misunderstood. 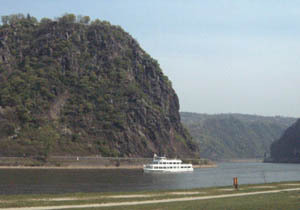 The Legend is centred on town of Bacharach and the River Rhine. This derived from events when I lost control, to some extent of my abilities. I was imbued with sufficient power, abilities, that my aura was several kilometres across, at least it was at times when I made the appropriate connection or connections, with the non-physical our spiritual Home, real Home. To an extent I did not know what I was letting myself in for. That was part of my learning for that lifetime. Suffice to say that, even with my powers under control, some people would not know what had hit them in your modern parlance. When I was unable to control them, at least unable to do so properly, the situation was even worse. In any age the different are ostracised, outlawed, not understood; as much so in your time in many ways as then despite the supposed advances in science and civilisation. I had chosen to be a Healer in that lifetime though assumed that I could cope with the powers that I was given. In the event they proved too strong for me and were, in a sense, my undoing. There was nothing malicious at all involved, more like being presented with a powerful sword that the recipient could barely lift, let alone wield as it was meant to be, never mind precisely and deftly as it should be. I was given a gift that was barely within my control; sometimes it was not, to my great and eternal regret. The love of my life, in that lifetime, though even then I new it was of many lifetimes, was my Soulmate. In our Rhine days he was known as Kurt Langerhan, or something similar, at least that was his name when I knew him. These days I work part-time, very part time, as a Healer in your physical world, though in this age I am discarnate. Not that I will always be so. I have many physical lifetimes to come, as I have many others behind me. The term is actually not appropriate, time being an illusion, though so is the physical worlds which we inhabit from time to time.